While U.S. intelligence officials have spent more than seven years searching fruitlessly for Osama bin Laden, UCLA geographers say they have a good idea of where the terrorist leader was at the end of 2001 — and perhaps where he has been in the years since. 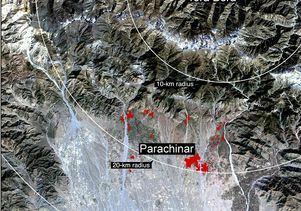 In a new study published online today by the MIT International Review, the geographers report that simple facts, publicly available satellite imagery and fundamental principles of geography place the mastermind behind the Sept. 11 attacks against the U.S. in one of three buildings in the northwest Pakistan town of Parachinar, in the Kurram tribal region near the border with Afghanistan. "If he's still alive, he honestly could be sitting there right now," said Thomas W. Gillespie, the study's lead author and an associate professor of geography at UCLA. "It is still the safest tribal area and city in the Federally Administered Tribal Areas (FATA) of northwest Pakistan and one of the only tribal areas that the U.S. has not bombed with its unmanned Predators." Despite keen interest in the terrorist recluse and a $25 million reward for information leading to his capture, academics have shied away from getting involved in the quest to find him, the researchers contend. Meanwhile, dramatic improvements in remote-sensing imagery have improved the odds of civilians doing so. "We believe our work represents the first scientific approach to establishing bin Laden's current location," said John A. Agnew, study co-author and UCLA geography professor. "The methods are repeatable and could easily be updated with new information obtained by the U.S. intelligence community." The researchers advocate that the U.S. investigate — but not bomb — the three buildings. They warn that if bin Laden indeed remains to this day in the tiny city of Parachinar, or even elsewhere in the relatively thinly populated tribal area of Kurram, he may move to the city of Peshawar (population 1.4 million) in the neighboring tribal area of North-West Frontier Province if Peshawar falls to the Taliban. News reports have warned of that possibility since last summer. "If bin Laden were to move to Peshawar, which would become an option if the Taliban were in control there, the search would become much more complicated," Gillespie said. "It's the difference between looking for someone in L.A. versus in Big Bear," he added, referring to a mountain resort town 90 miles east of Los Angeles. The findings are based on the last information on bin Laden's whereabouts to be made public by U.S. intelligence sources, which have closely guarded the details of any efforts to locate him. One and a half months after the coordinated attacks on the World Trade Center and the Pentagon claimed the lives of more than 3,000 people, a walkie-talkie radio broadcast placed bin Laden in Tora Bora, a cave complex in eastern Afghanistan. In an unsuccessful attempt to capture bin Laden, U.S. forces attacked the caves the following month. The UCLA findings rely on two principles used in geography to predict the distribution of wildlife, primarily for the purposes of designing approaches to conservation. The first, known as distance-decay theory, holds that as one travels farther away from a precise location with a specific composition of species — or, in this case, a specific composition of cultural and physical factors —the probability of finding spots with that same specific composition decreases exponentially. The second, island biogeographic theory, holds that large and close islands have larger immigration rates and will support more species than smaller, more isolated islands. Inspired by distance-decay theory, the seven-member team started by drawing concentric circles around Tora Bora on a satellite map of the area at a distance of 10 kilometers — or 6.1 miles — apart. 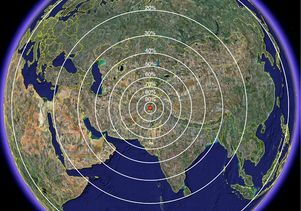 "The farther bin Laden moves from his last reported location into the more secular parts of Pakistan or into India, the greater the probability that he will be in an area with a different cultural composition, thereby increasing the probability of his being captured or eliminated," Gillespie said. Then, informed by island biogeographic theory, the researchers scoured the rings for "city islands" — or distinctly separate settlements of considerable size. "Island biology theory predicts that he would find his way to the largest but least isolated city of that area," said Gillespie, an authority on measuring and modeling biodiversity on Earth from space. "If you get stuck on an island, you would want it to be Hawaii rather than one with a single palm tree. It's a matter of resources." The approach netted 26 cities within a 12.4-mile radius of Tora Bora on imagery from Landsat Enhanced Thematic Mapper Plus (ETM+), a global archive of satellite photos managed by NASA and the U.S. Geological Survey. With a 2.7-square-mile footprint, Parachinar turned out to be the largest and fourth-least isolated city, the team determined. "Based on bin Laden's last known location in Tora Bora, we estimate that he must have traveled 1.9 miles over a 13,000-foot-high pass into Kurram and then headed for the largest city, which turns out to be Parachinar," said Agnew, who is the current president of the Association of American Geographers, the field's leading scholarly organization. The researchers ruled out cities on the Afghanistan side of the border because the country was occupied at the time by U.S. and international forces and has been particularly unstable ever since. "The Pakistan side of the border is much better for hiding because of its ambiguous political status within the country and the formal absence of U.S. or NATO troops," Agnew said. Faced with the prospect of picking from more than 1,000 structures clearly portrayed in the satellite imagery of Parachinar, the team decided to come up with a short list of the criteria that bin Laden would need for housing, based on well-known information about him, including his height (between 6'4" and 6'6", depending on the source), his medical condition (apparently in need of regular dialysis and, therefore, electricity to run the machine) and several basic assumptions, such as a need for security, protection, privacy and overhead cover to shield him from being spotted by planes, helicopters and satellites. So they looked for buildings that could house someone taller than 6'4" and were surrounded by walls more than 9 feet tall (both as judged by mid-afternoon shadows depicted on the satellite imagery), and that had more than three rooms, space separating them from nearby structures, electricity and a thick tree canopy. Only three structures fit the criteria. The buildings also appeared to be the best fortified and among the largest in Parachinar. Two are clearly residences, the study states. The third may be a prison. But whatever the third structure is, it has "one of the best maintained gardens in all of Parachinar," the study says. While the three structures meet all six of the criteria that the researchers believe would be required for lodging bin Laden, an additional 16 structures in Parachinar appear to meet five of the six criteria. If bin Laden is not in the first three structures, the U.S. military should investigate these other buildings, the study urges. The outgrowth of an undergraduate geography course in remote sensing, the study lists five 2008 UCLA graduates as co-authors. The students have since gone on to a range of endeavors, from selling real estate and attending law school to earning a master's degree from Oxford University. One now works for a remote-sensing company. Undergraduates had attempted to take on the same study in 2006, but at 30 x 30 meters — or nearly 100 x 100 feet — the resolution of publicly available satellite images of the area at the time was insufficient. In contrast, today's resolution is 0.6 meters, or just under 2 feet, Gillespie said. The remote-sensing company that employs one of the alumni authors plans soon to unveil a 0.4-meter resolution of the entire world. "Technology has caught up to the question," said Gillespie, who serves as the director of the Spatial Demography Group for the UCLA-based California Center for Population Research. "Finding Osama bin Laden: An Application of Biogeographic Theories and Satellite Imagery" is not the first attempt by Gillespie and Agnew to bring scientific analysis to nettlesome political issues. In September 2008, they received widespread attention for a satellite study of the density of lights in the night sky of Baghdad in the time leading up to, during and immediately following the U.S. military surge of 2007. The findings cast doubt on the role claimed by the U.S. military in quelling violence during that time and suggest instead that intra-sectarian conflict was responsible for clearing whole portions of the city, leaving them both dark and devoid of the objects of Iraqi-on-Iraqi violence. Due to the low cost of conducting the study, it received no outside funding. However, past research by Gillespie has received funding from the National Institute on Aging, the MacArthur Foundation and the National Science Foundation. The MIT International Review is a peer-reviewed interdisciplinary journal of international affairs that is dedicated to solution-oriented discourse on challenges facing the global community. Located in northwest Pakistan, Parachinar is 12 miles from Tora Bora, the last confirmed location of Osama bin Laden.